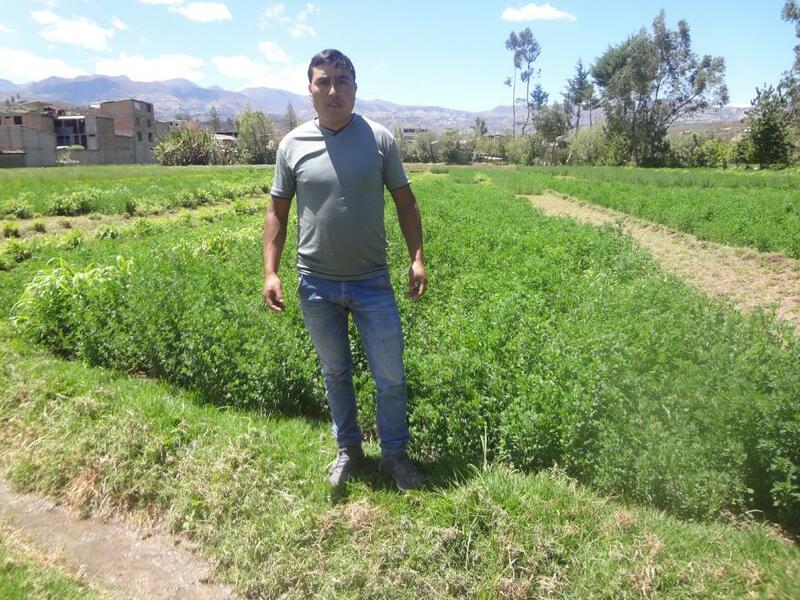 A loan of $2,500 helped to purchase organic fertilizers and alfalfa seed. Santos Edis is 31 years old. He is single and is an agricultural technician by profession. Santos is a responsible, hard-working, and enterprising person. The loan will be used to purchase alfalfa seed and organic fertilizers in order to increase the grazing area for raising cattle and to raise guinea pigs. He has five years in this business. His dreams are to improve his income and his family’s living conditions. What he likes most about his business is producing more and earning money to help his family. El Sr. Santos Edis tiene 31 años, es soltero y de profesión técnico agropecuario. El Sr. Santos es una persona responsable, trabajadora y emprendedora. El préstamo servirá para la compra de semilla de alfalfa y abonos orgánicos, con la finalidad de incrementar del área de pastos para la crianza de ganado vacuno y crianza de cuyes. Tiene 05 años en el negocio y sus sueños son mejorar sus ingresos y las condiciones de vida de su familia. Lo que más le gusta del negocio es producir más y ganar dinero para ayudar a su familia. It helps farmers diversify their sources of income and better provide for their families. This loan allows rural Peruvian farmers to diversify their crops, allowing for a more staggered harvest season and more consistent cash flow. By supporting this loan, you are empowering a farmer to strengthen their financial security. The Asociación de Productores de Tara del Norte (APTN) was founded in 2003 and has since grown its network of small-scale farms into one of the largest producers of tara in all of Peru. Tara is a small tree native to Peru that provides an excellent source of environmentally friendly tannins used to manufacture automotive and furniture leathers. APTN serves small-scale tara farmers who have little access to financial services and are generally unable to command high market prices for their crops on their own. Kiva loans are used to finance the purchase of organic fertilizer and insecticides as well as allow farmers to diversify their crops by adding aguaymanto and/or quinoa to their land. Kiva supports APTN’s commitment to breaking the cycle of poverty in Peru with financially and environmentally sustainable farming solutions.